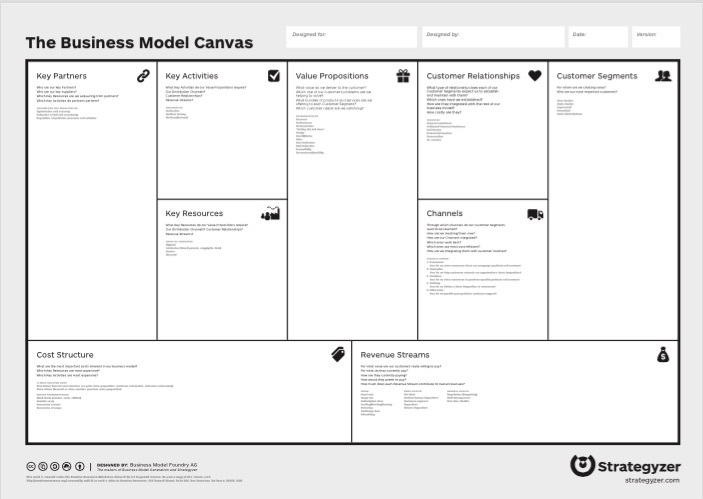 The Business Model Canvas is definitely the most common and widespread tool for business model Innovation. The nine different building blocks help you to get a comprehensive and fast overview and understanding of your business model. The most common and widespread tool for developing and visualizing a business model is the Business Model Canvas by Alexander Osterwalder and Yves Pigneur. The canvas was co-created with many practitioners and was based on The Business Model Ontology developed by Alexander Osterwalder in 2004. The results are a best-seller book, entitled Business Model Generation, and the tool Business Model Canvas. The canvas has been published online with a Creative Common License and therefore published and iterated by many practitioners. 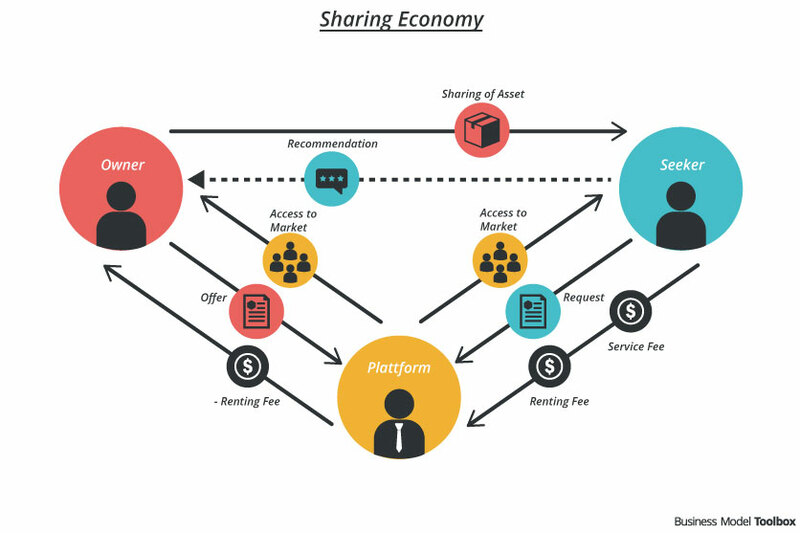 The underlying idea is, that a business model consists of nine building blocks describing the value proposition, customers, value delivery and value creation, as well as the financial perspective. Value Propositions: What kind of value do you deliver to your customer (e.g. efficiency, convenience, social status, low prices)? How do you satisfy your customers’ needs? Customer Segments: For whom are you creating this value? Can you differentiate between different customer groups? Channels: How do you deliver the value to your customer segments? This starts from raising awareness and also applies to purchasing, delivery and aftersales. Customer Relationships: What is the relationship between you and your customer? E.g. self-service, personal assistance during sales, creating a community where members share knowledge. Revenue Streams: How do you generate revenue? Whom do you generate revenue from and what form does the revenue have (e.g. subscription fee, renting fee, advertisement, etc.)? Key Activities: How do you generate value (service / product) for your customer? Key Resources: What knowledge, infrastructure and financial resources do you need? Key Partnerships: Who are our partners that help us to create value? Who are our suppliers? Cost Structure: What costs arise from creating and delivering value to your customer, from your key activities and your key resources? How to apply this tool? The use of the Business Model Canvas is not restricted to any industry or application. The focal point of the model is the company itself. In every building block there is a short description and some examples that can help you when filling the canvas. With an idea: start with defining the value proposition for a specific customer segment. With potential / existing customers: start with the customer segment, ask what value proposition you are delivering / could deliver to them and how. With your resources: start thinking about what key resources (competences, experiences, physical resources, financial resources, etc.) you and your partner(s) have and, based on this, develop your offer for a specific customer group. The question “what value is created for which customer groups?” is the center and therefore the focal point of the Business Model Canvas. 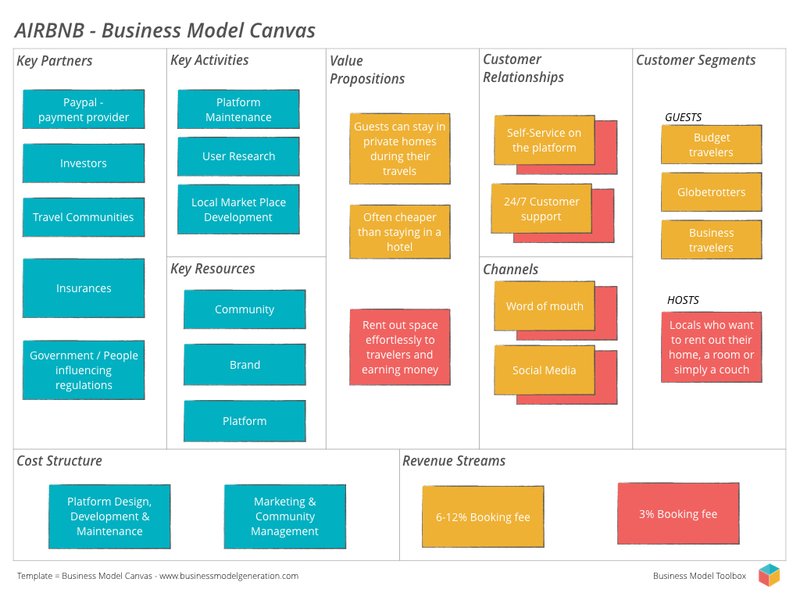 The Business Model Canvas contains these two elements: revenue streams and costs. These are crucial in order to create a financially sustainable business model. “LinkedIn Business Model” by bmimatters. Businessmodelgallery.com is a database with more than 100 company business models visualized with the Business Model Canvas. My thoughts and experience of this model is very useful. I was thinking of doing the same structure in kenya where majority of the population is poor with less access to medical treatment. I like the canvas model and finding ways to convince local Doctors and hospitals to emulate the same model. The most challenging thing is balancing between giving out services without going at a loss financially.